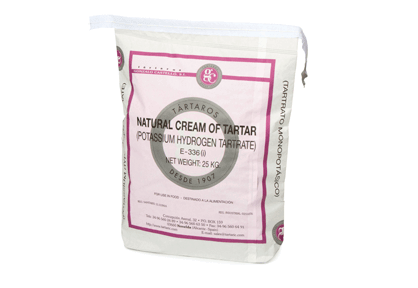 Cream of tartar, also known as POTASSIUM BITARTRATE, is a white powder. It is a NATURAL product made from the natural crystalline acid deposited on the walls of wine-cellar vats. The production process includes strict and thorough quality control supervised by our engineers in order to ensure the ultimate quality of the product. Natural Cream of Tartar is included in the list of FOOD ADDITIVES under code number E-336(i). 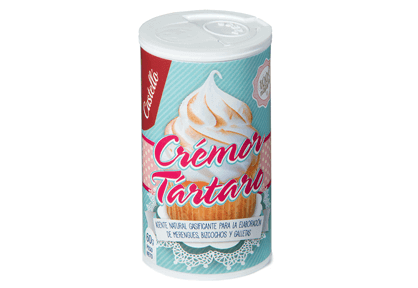 Cream of tartar is the basic ingredient of baking powder. 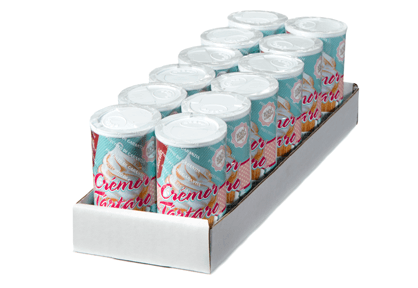 It is used as a natural additive in the preparation of cookies, meringues, etc. 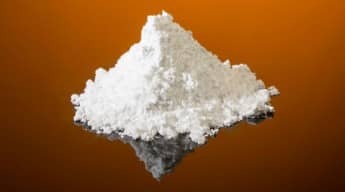 It is used in tartaric acid stabilization. Use of potassium bitartrate in cold stabilization reduces wine cooling times to less than 24 hours, which represents a major saving in energy while ensuring fully satisfactory results. Solubility in water: at 10º C: 4g/1000 ml. at 100º C: 61g/1000 ml. Principal impurities: Meets the limits established in the most recent editions of the FCC, BP, USP, European Directive, and the Oenology Code. Use 1/8 teaspoon per egg white to keep them stable and add volume. 2 parts cream of tartar, 1 part baking soda and 1 part cornstarch. Make a paste using cream of tartar and vinegar. Buff paste on the metal surface and wipe with a clean rag. In a sauce pan place a ball of aluminum foil, 1 quart of water and 2 tablespoons of cream of tartar. Bring the water to a boil and add silver items to be cleaned. Boil for 10 minutes then remove from heat and let it cool. Then rinse.